Imagine my surprise to see Wander Over Yonder nominated for an Emmy. Among the other worthy competitors (Adventure Time, the new Mickey Mouse shorts, Regular Show, Steven Universe, and… Robot Chicken? ), Wander stands out, mainly because on the surface it’s just a wacky animated comedy in space, prone to using old-school gags and good ol’ fashioned squash-and-stretch movement. It moves fast and rarely lets up, something that seems to have been going out of favor in terms of modern-day cartoons. It feels like they’re making a comeback, though (with shows like Star Vs. The Forces Of Evil and Turbo FAST embracing that kind of wackiness with aplomb), and the episode nominated, “Gift 2: The Giftening,” is perhaps the purest and most creative example of the form. (In my own personal poll I voted it best animated episode of television of 2014; that the Emmys noticed it as well might be a sign of a more open acceptance of that kind of cartooning). Craig McCracken mentioned on Twitter that “The Void” was one of the cartoons he’s most proud of, but part of me thinks there had to be some discussion over how it may have soured the perspective of Sylvia and Wander’s friendship. Which might explain why the show decided to shift from being a broad set of absurd, intergalactic adventures to a more focused season-long arc, providing an outside force at which the characters could throw their intensity, instead of each other. “The Greater Hater” begins that four-part story arc, followed by a series of episodes loosely related to the events of said arc. And that first part is masterful, exemplifying Wander’s signature visual style and using it to explore the main drives of the show’s four main characters as they face a villain completely immune to their most default characterizations. 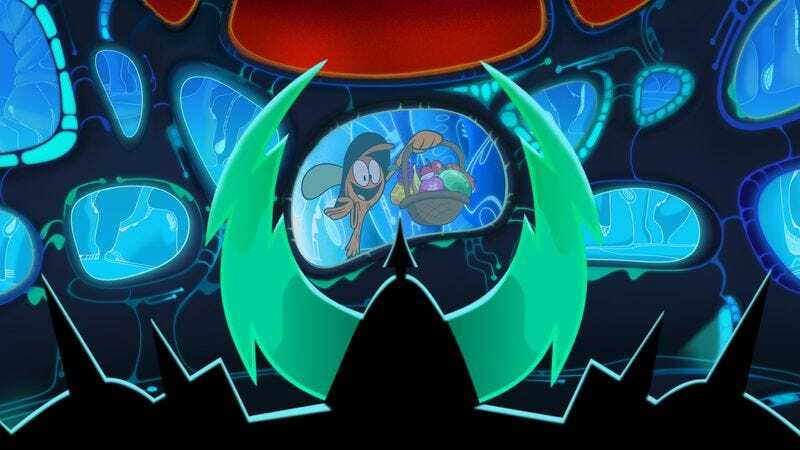 (That includes Commander Peepers, who received a lot more development over the course of the first season as the most grounded–if overly-dedicated–member of the crew). There’s going to be a lot to talk about over the next few weeks about how the show looks, and how that visual design adds so much impact to both its comedy and its heart. But “The Greater Hater” is noteworthy because it’s so self-reflective, exploring Wander, Sylvia, Lord Hater, and Commander Peepers as they go up against the immovable (both literal and metaphorical) Lord Dominator. So often in season one, even at their lowest, these characters have been able to “win,” either by Sylvia’s brute strength, Hater’s comical brutality, Peeper’s dedicated resolve, or (most importantly) Wander’s positive persistence. These personalities have always butted up against each other, but they still led to successes of a sort (Hater’s “wins” were more about confirming his inflated self-worth, even if he never actually succeeded in his plans). So to see each character completely fail against this mysterious new villain suggests their interplay is specifically suited only for each other, which is especially on display in their collective mad-dash escape from the flowing lava. Wander himself is particularly interesting here, and while I can see a lot of older viewers turned off by his abundant energy, I think it’s important to see such a true believer in the power of friendship. He’s Steven Universe times one hundred, deeply committed to giving Dominator that fruit basket because he just knows “an enemy is just a friend you haven’t made yet.” He truly believes in the innate goodness of the forces of the universe, and yes, there’s a certain naiveté to that, but it’s a catching feeling, which is why it’s genuinely crushing to see his depression when he fails to move Dominator. It’s why Sylvia hangs out with and is so protective of him, and consequently, it’s why he drives Hater crazy. Hater at least responds to Wander’s optimism; in some ways, Dominator’s non-reactions are an even bigger sin. “The Greater Hater” ends with no one actually discovering who Lord Dominator is. There are some minor wins, particularly for Hater and Peepers–the former exhibiting some serious power at his most unhinged, the latter seeing (at least to some extent) Hater’s jealousy of Dominator less as petty concern and more as a motivating factor. (“You can’t run if you want to be number one,” after all.) The last shot of the four main characters leaves them clinging to each other, asking out loud “WHO IS THIS GUY,” placing them at a similar level, confused as to how to confront this new antagonist and what to do next. This season is going to be extremely interesting. As the piece implies, yes, I’ll be covering Wander Over Yonder weekly. I love this show and look forward to doing this, and if you’re wondering why The A.V. Club decided to cover this show of all shows, I’m not sure. I think this might be a test run to see how well weekly coverage of a kids show outside the “norm” might work. Seriously, though, Wander Over Yonder is such a beautiful show. If anything, its technical aspects have to be acknowledged. Its use of colors and lighting allows it to make one episode feel carefree and appealing (“The Good Deed”) and the next tense and terrifying (“The Pet”). And the framing and editing is so on point. The “Nothing. Never. Changes.” cuts, with each shot pulling out further away from Peepers nails the moment perfectly while setting up the next beat. The only thing that held this back from a full A was Lord Dominator’s reveal. Partly because it was kind of obvious, partly because the marketing already exposed the twist, and partly because Dominator’s actual character is a a bit undefined. I hope there’s more going on with her than “flighty girl who trolls the universe because it’s fun,” but I trust the show to develop her over time.